"I'd rather be free in hell than a slave in heaven." Those are the lines from Eren, the hero from the Attack on Titan live action movie which is worthy for an opening. Those were Eren's lines against their general who promised life in the inland (inner wall where leaders, thinkers, and elitists reside). Eren, along with friends Armin and Mikasa were originally from the outer walls (the agricultural land). The three friends were always curious to know what lies on the other side of the protective wall. But they weren't ready to see what's actually found behind those walls. What's up with walls by the way? I remember how Divergent's plot also revolved around a walled city which turns out to be but an experiment from its founding fathers. And it took them 100 years to figure it out. In Attack on Titan, it's also been 100 years before they finally saw what's outside the walls (the ocean). But unlike Divergent, where leaders from the outside wall actually expected those inside to figure out how to reconnect with them outside; in Attack on Titan, whichever powers kept them within the three walls wanted to keep them there by instilling fear through the Titans (a human evolution government experiment). Shikishima (Eren's older brother - although it's not clear on the movie yet) showed Eren one of the bomb shelter facilities where secret leaders spy over everyone living inside the walls. I waited long enough for the movie credits to roll and saw a teaser at the end about this too. There is no news of any sequel after this film though. Some characters from the original manga were not included. But the movie is definitely more fast paced than the manga with a run time of less than two hours. Hence, it's but expected to squeeze everything in a limited time. This makes the film more exciting though because there's no minute wasted and all scenes are relevant to the movie. The added characters are also interesting. See this related post about this topic from the Japino.net blog for Pinays living in Japan, 5 Reasons Why You Should Watch Attack on Titan Live Action Movie . Speaking of the manga, Eren's last name, Yaeger or Jaeger reminds me of Pacific Rim, where mecha bots are called Jaeger as well. It's quite challenging to describe what the movie can be categorized under. It's definitely full of action but can also be considered horror or fantasy in nature. Expect a lot of gore too so you should definitely not watch this if your stomach is weak. The movie trailer below can give you a glimpse of what to expect. The Samurai X live action movie series introduced me to One Ok Rock and their definitely more than OK list of songs including tracks used for the Rurouni Kenshin movies like The Beginning, Mighty Long Fall, and Heartache. Be the Light, was written after the 2011 earthquake and tsunami which killed 15,893 people and leaving 6,152 injured with 2,572 missing. 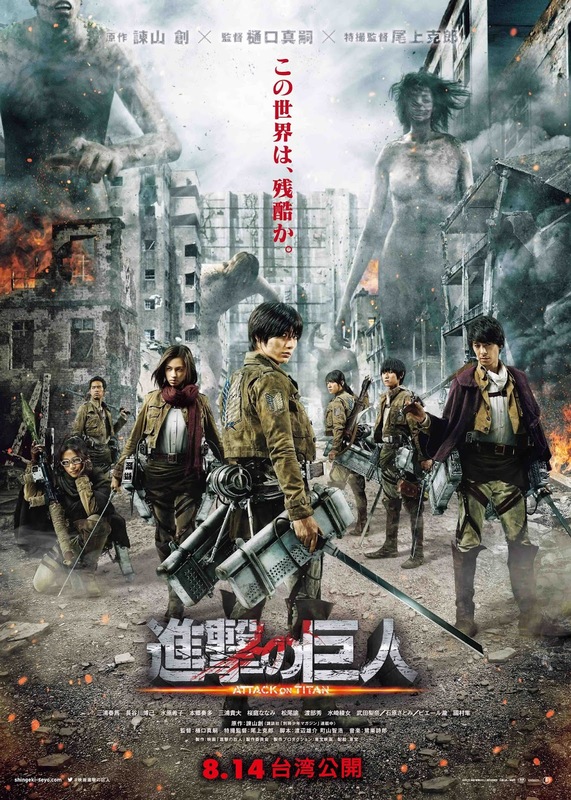 In Attack on Titan, I enjoyed Sekai no Owari's Anti-hero. The lyrics of the song is unique. It's political, philosophical, and is going against the norm. In relation to the theme song, it perfectly fits the movie's subtle theme. It's not about rebelling against authorities but it's against following a leader with a blindfold over your eyes. Don't be a cattle. Hence, Eren says, ""I'd rather be free in hell than a slave in heaven." For more information on the movie including the complete cast of characters and other details, see Wikipedia.